Dueling was a ritual of violence practiced by gentlemen who followed the so-called code of honor in the antebellum South. A perceived insult to the manliness, integrity, or reputation of a gentleman often led to a duel. The offended party challenged his antagonist in order to protect his "honor" in the eyes of the community. Though dueling was uncommon in the colonial South, British and French officers made the practice more popular in the region during the Revolution. The first record of a duel on North Carolina soil involved two British naval officers, Alexander Simpson and Thomas Whitehurst. The two men, rival suitors for the affections of a local woman, fought at Brunswick on 18 Mar. 1765. An American officer from Maryland killed a British colonel in a duel with swords during the Battle of Guilford Courthouse (15 Mar. 1781). Samuel Swann and John Bradley of Wilmington fought possibly the first duel between native North Carolinians behind the Episcopal church in that town on 11 July 1787. Bradley killed Swann and was charged with murder, but he was pardoned by the governor on recommendation of the Assembly. The heyday of dueling was after the turn of the century. On 5 Sept. 1802, John Stanly killed former governor Richard Dobbs Spaight behind the Masonic hall in New Bern in one of the most famous duels in state history. Although the legislature outlawed dueling in the wake of Spaight's death, North Carolina society condoned affairs of honor, and the law was not enforced. Political rivalries alone account for at least 27 duels in the state between 1800 and 1860; the combatants included legislators, governors, and U.S. senators. If the complete list of all the principals and seconds who participated in duels in antebellum North Carolina could be compiled, it would include many of the state's most prominent males. 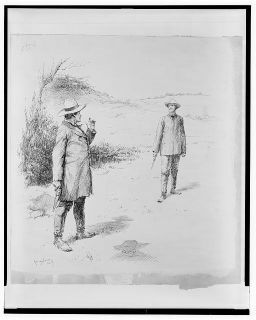 In North Carolina dueling began to disappear in the years just before and after the Civil War. In the last recorded duel between native North Carolinians, Joseph Flanner killed fellow Wilmingtonian William Crawford Wilkings in a contest that took place across the state line in South Carolina on 3 May 1856. A prominent Buncombe County citizen sent two challenges as late as 1885, but the duels were not consummated. The demise of dueling indicates that public opinion finally supported legislation that outlawed the practice. W. Conard Gass, "'Misfortune of a High Minded and Honorable Gentleman': W. W. Avery and the Southern Code of Honor," NCHR 56 (July 1979). Barbara Holland, Gentlemen's Blood: A History of Dueling from Swords at Dawn to Pistols at Dusk (2003). Jack K. Williams, Dueling in the Old South: Vignettes of Social History (1980). Calvin Jones Papers. State Archives, North Carolina Office of Archives and History, Raleigh, N.C.
John Oliver Account Book. State Archives, North Carolina Office of Archives and History, Raleigh, N.C.
Johnson, Guion Griffis. Ante-Bellum North Carolina: A Social History. Chapel Hill: University of North Carolina Press, 1937. McKown, Harry. 2005. “This Month in North Carolina History: September 1802, Spaight-Stanly Duel” UNC University Libraries, September 2005, http://www.lib.unc.edu/ncc/ref/nchistory/sept2005/index.html. PBS Kids. 2000. A History of Dueling in America. Stevens, John Austin et al. 1891. The Magazine of American history with notes and queries. New York: J.J. Little & Co.
Watson, Alan D. 1987. A History of New Bern and Craven County. New Bern, N.C.: Tryon Palace Commission. The Duel, 1887. Created by E.W. Kemble. Courtesy of Library of Congress. Available from http://www.loc.gov/pictures/item/2010717062/ (accessed October 8, 2012).